A joint research project of leading German maritime specialists, OptiSWATH was being finalized in 2008 after a run-time of three years. The R & D venture aimed at the development of a practical tool for the design of SWATH (Small Waterplane Area Twin Hull) ships with focus on the integration of established simulation codes and seakeeping analysis. SWATH vessels are special purpose ships in twin-hull construction with a platform deck well above the waterline. Because the ship volume near the surface of the sea is limited, the vessel is almost decoupled from wave excitation. This leads to outstanding seakeeping behavior and stability. The design of SWATHs, however, demands dedicated design methods and high engineering expertise. Both the lack of design formula for SWATH ships and the industry’s need for a practical answer to hydrodynamic analysis and optimization demands in SWATH design made an effective design tool vital. 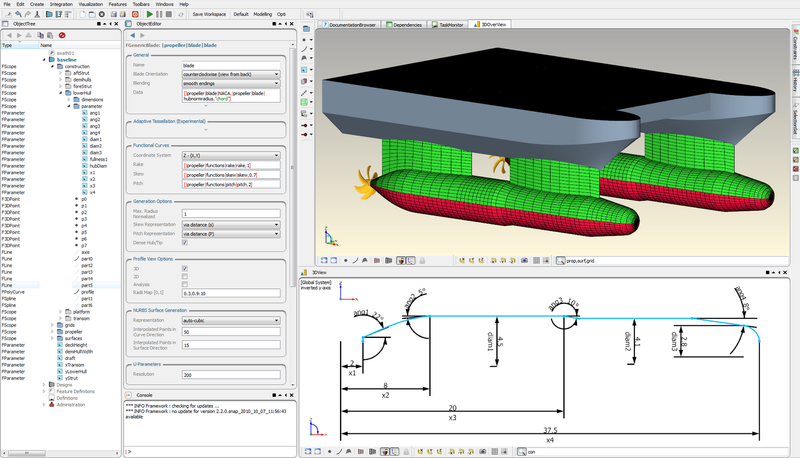 Each bringing in their unique expertise, the project members developed a fully automated software system for the hydrodynamic optimization of SWATH designs, into which CAD and CFD tools for parametric modeling, calm water hydrodynamics and seakeeping analysis were integrated. 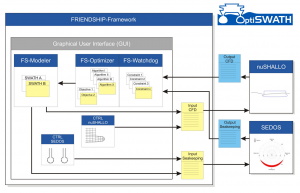 Simulation-driven design software CAESES®, developed by FRIENDSHIP SYSTEMS, served as geometric modeler and as integration platform for HSVA’s potential flow code ν-Shallo-SWATH and for MTG’s seakeeping analysis tool SEDOS. 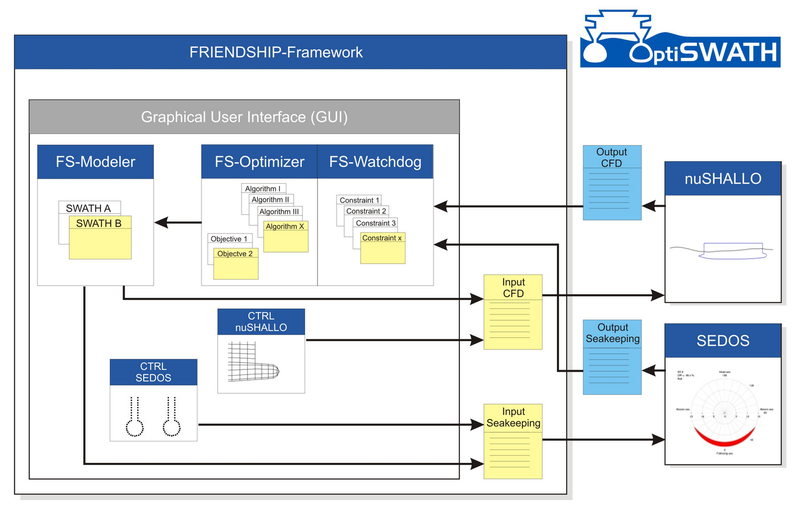 Note that CAESES® was formerly called FRIENDSHIP-Framework. CAESES® was coupling and control platform. It provided the graphical user interface (GUI), techniques for form development and optimization as well as data management strategies. Accommodating the software to the project, controlers for SEDOS and ν-Shallo-SWATH were developed, the GUI was adapted and the Constraint Management technology was further defined. By view of the project partners, CAESES® was the “heart” of OptiSWATH. OptiSWATH delivered a tool which is suitable for all types of SWATH vessels as well as for other ship types. Typically, SWATH customers impose stringent requirements on the seakeeping performance, but also expect low power consumption even when traveling at higher speeds, for which a reduced weight is needed. These tasks were tackled in three phases: Firstly, the tools were “sharpened” to make them suitable for the project. Software was adapted to the requirements of SWATH vessels, initial parametric models were designed. Secondly, the analysis tools were integrated into CAESES®. Thirdly, tests and validation were undertaken. At the end of each phase, all partners participated in trainings and workshops to share, exercise and discuss the findings. The newly developed design and optimization system OptiSWATH has been successfully utilized for a number of academic and commercial projects since its launch. 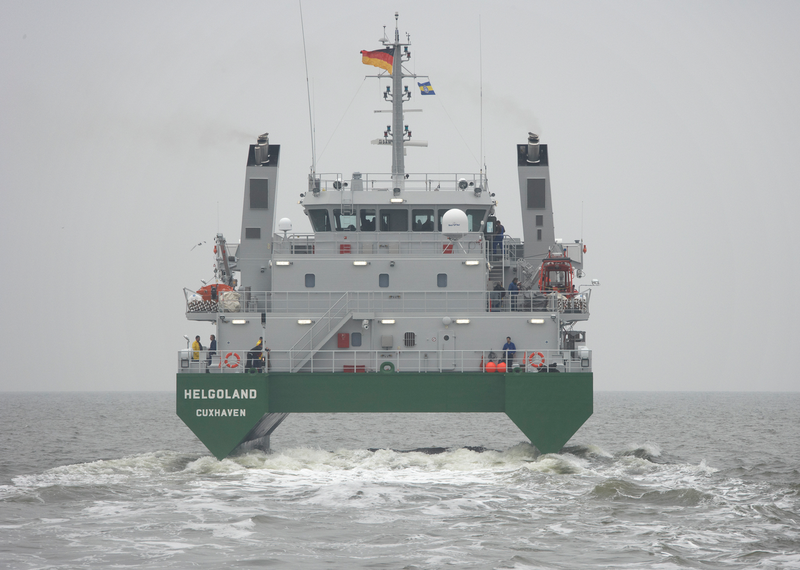 With first results of the running project, NSWE won the contract for building two offshore patrol SWATHs for the German customs office in late 2006. With the tools developed in OptiSWATH, the hull form of the ships was developed, optimized for resistance and analyzed for seakeeping. After towing-tank tests of the hull form and further optimization, the final form was chosen for construction. Successfully delivered, “Helgoland” has been in operation since August 2009, her sister ship “Borkum” since February 2010.